Home > Uncategorized > Who is this pink baby? When I first arrived at my mission site, Yapacaní, Bolivia there were many things to grow accustomed to, some things which I never will get used to: non-stop sweating, attending morning prayer at 6:15am, eating rice for every meal, speaking in Spanish, not using seat belts, praying fervently until I leave any vehicle, carrying toilet paper with me everywhere, and so on. Now my eyes have grown familiar to the faces I work with and the scenery around me. There is an image that has struck me more than others recently. It follows me in taxis; in churches; it’s even on my own calendar. Divino Niño Jesús, The Divine Child Jesus. Seeing baby Jesus outside of Christmas, is well, foreign. To see our Lord in pink, is well, different! Days after I arrived, my fellow missionaries and I celebrated Thanksgiving. It was a pleasure to catch up and speak English. Yet I couldn’t relate to my friends because they had been working for two months in orphanages. Soon I learned I’d be working in a radio/tv station (because of my previous experience) and translating for a Canadian charity. Yet where were the children? I have a weekly schedule, which rarely follows my plan: I update the Ichilo Radio/ TV station’s website and maybe edit a commercial, then for lunch I serve the elderly in El Comedor (the soup kitchen), and in the afternoon translate as many letters I can from Spanish to English. Sundays I go to Mass multiple times, where I play the local songs. Life can become hard, removed from friends and family, and especially when you’re sick and believe that the medicine is actually making your bowel movements worse. When I share my troubles with my site partner, Adam he gives me solid advice. “You should reread your mission statement,” he suggested. When I did a gentle breeze passed through my mind and soul. 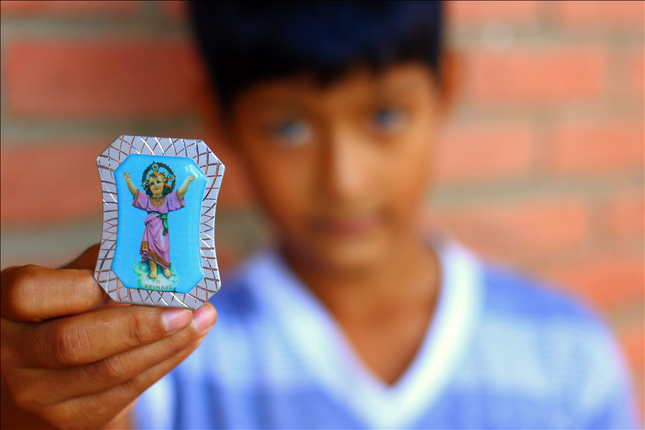 “To be molded into the man God longs for me to be through his children in Bolivia.” But where were the children? Mondays are Adam and my día libre (free day). On those days we go to the children’s hospital. 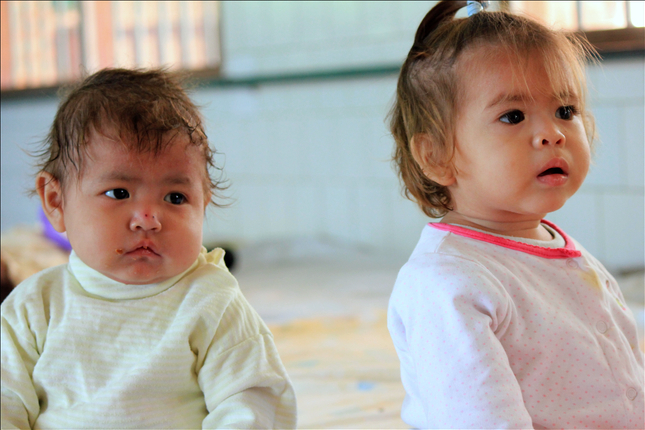 It’s a beautiful place for mothers to learn how to care for their newborns, as they care for other babies. Every time we go the children grow a little more. And every time, Cynthia cries the entire time. Maybe it’s us. Yet there are others whose bright smiles entice us to return. We talk about another baby, the pink Divino Niño Jesús. We couldn’t understand where it originated—maybe it’s a Bolivian apparition? We concluded that it is supposed to open our hearts more to Christ since it’s easy to love a baby. Saturdays there’s oratory. In the past I’ve been unable to go due to work in the TV station. Yet one afternoon I realized there was nothing to keep me away. I just didn’t want to go because it was different. I had just left the station. “Hola!” I heard a tiny voice. I turned and saw a familiar face. It was a boy of 5 years old who plays with the keyboard that I use for Mass. “Are you coming to oratory?” he asked me in Spanish. I tried to give him an excuse. But I couldn’t. “Sí,” I said, thinking I would buy some toiletries first then return. “Okay!” he shouted with a grin. Before I could leave to buy more toilet paper Padre waved me over. While he was explaining the essence of the Salesian charism – the youth – I suddenly felt something grab my hand. I looked and saw that little boy. “¿Vamos?” he asked me. I laughed. “Sí, vamos,” I said and let him lead me into oratory. My little angel. I was silly to be afraid. He guided me through and quickly I found myself surrounded by children. Their faces grew, crowding me with laughter and smiles. I turned to look for my guide. He was gone and I was fine. Ever since that Saturday I have returned to oratory; readying myself to open my heart a little more. 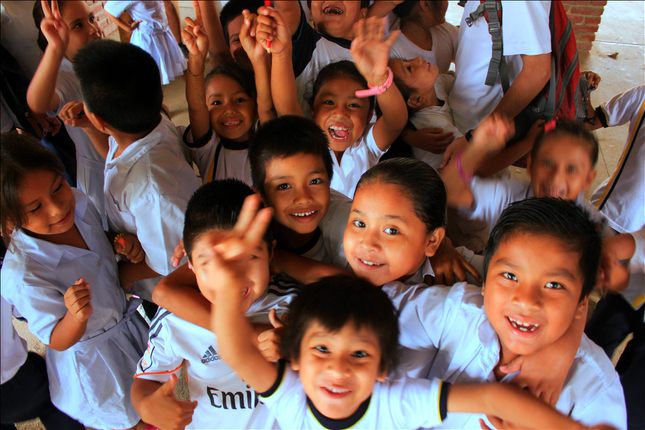 Since then more opportunities to interact with the children of Yapacaní have appeared. Tuesday nights I teach a confirmation class and more recently Fridays morning I teach a religion class. One year. It’s a small amount of service. To answer the question “how do I live?” it’s simple. Trust. I fail at it consistently, but from what it was before, it’s significant. God puts people, sometimes a baby in pink, in our lives to aid us in this sojourn toward Him. I pray that whatever little service I do here will aid these children in their path toward Him. To learn more about Salseian Lay Missioners, click here!